While I've been swanning around Jakarta, having a very good time indeed, Cheri and Hans-Jörg have been hard at work back in Pennsylvania. They arrived from Germany 23 March, leave 4 May, and thus far have never taken a single full day off. The reason: Henry's list. This base at this corner of the garage was totally rotted. You can see why my father prefers German precision to my sloppy work. And that's not even considering all the serious reinforcement H-J had to provide. This garage worktable, cleared, polished, and tidy, is hard to recognize. Can it be maintained in this pristine state? 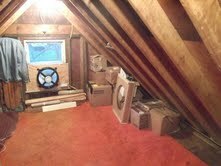 Attic of detached garage, also unrecognizably neat after removal of recent squirrel corpses and years of clutter. All this activity, which also included window cleaning, curtain washing, ironing, dusting, barbecue scouring, etc. etc., was punctuated by everyone at Creek Way coming down with gastric flu. The bug started with H-J and ended with Mom, who had to be taken to by ambulance to the hospital before dehydration set in. The most memorable images of this non-vacation, however, are of my sister in full squirrel-repelling gear. H-J discovered that these pests were not only in the detached garage, but a happy colony had infested the main attic of the house. I think she scared them off! !